In the aftermath of the largest elephant poaching episode thus far in 2013, Central African governments met to coordinate and adopt an emergency plan to combat the killings. But is it too little, too late? On March 14-15, at least 86 elephants were killed in Tikem, near Fianga in the Mayo Kebbi East region of southwestern Chad, close to the Cameroon border. 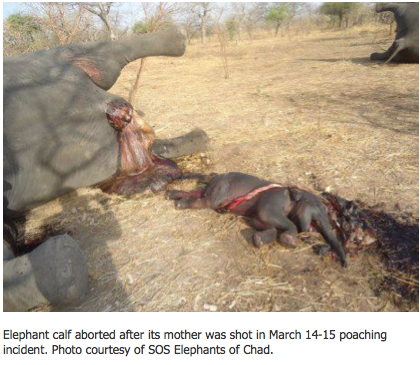 Among the victims were more than 30 pregnant females, many of which aborted their calves when they were shot. The calves were left to die, and reportedly some were shot. It’s too sickening to even comprehend. 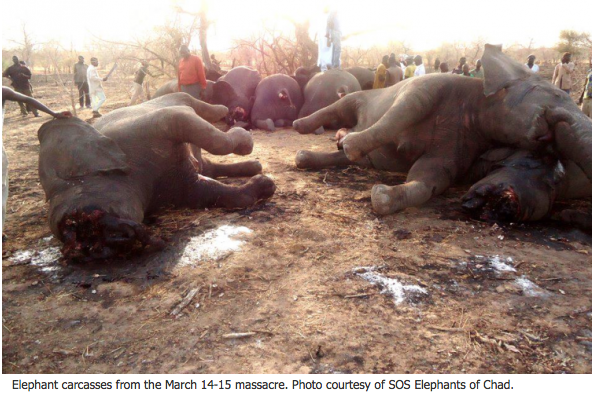 The massacre occurred in the closing hours of the Convention on International Trade in Endangered Species (CITES) 16th Conference of Parties (COP16) meeting (held in Bangkok from March 3-14), where the topic of elephants was high on the agenda. The timing was also just weeks after the discovery of 28 elephant carcasses, all stripped of their ivory tusks, in Cameroon’s Nki and Lobeke National Parks and at least 15 carcasses across four separate locations in Central African Republic. All these incidents followed numerous reports of columns of Sudanese poachers crossing Central African Republic and heading toward Cameroon and Chad. Both the Chad and Cameroon governments had responded to this advance notice. In December, the Chad government sent soldiers and military aircraft to patrol the region and Cameroon deployed its Rapid Intervention Battalion (BIR), a special forces military unit. But neither was able to find the poaching gangs and stop them. “We’ve been aware of the poachers’ presence and movements since last November in the Central African Republic, but given the means at hand, and difficulty of working in this vast, remote landscape, it has been very challenging to fully address the situation,” says Richard Ruggiero, Chief, Branch of Asia and Africa at the U.S. Fish and Wildlife Service. 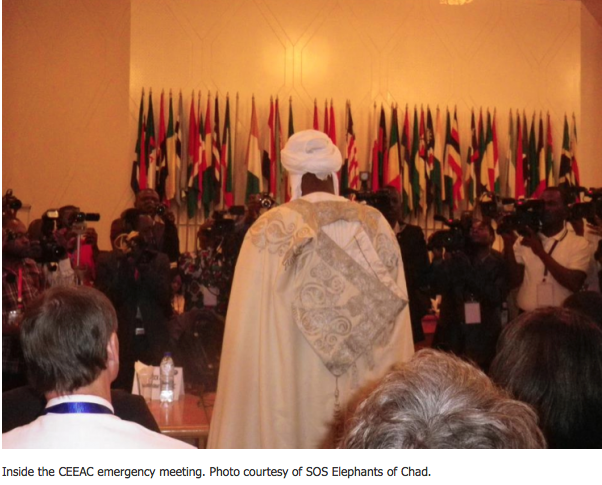 A three-day emergency meeting on the poaching of elephants, organized by the Economic Community of Central African States (CEEAC), was held in Yaoundé, Cameroon from March 21-23. The 70-plus participants included ministers of defense, foreign affairs, and wildlife protection, as well as representatives from the United Nations Development Program and other organizations, such as the World Wildlife Fund and SOS Elephants. Some attendees suggested that because key people such as the forces on the ground were not immediately involved, the assessment and resulting plans were not suitable for the real needs. The final declaration acknowledged that national initiatives to combat poaching and illegal wildlife trafficking had failed. It also reiterated the need for countries involved throughout the ivory supply chain (origin, transit, and destination) to coordinate efforts to combat the transnational, organized crime networks that are operating in the region. Delegates adopted a plan of extreme urgency to fight poaching (PEXULAB), which includes immediate anti-poaching measures in the northern zone of Cameroon, the north and southwest of the Central African Republic, and southern Chad. 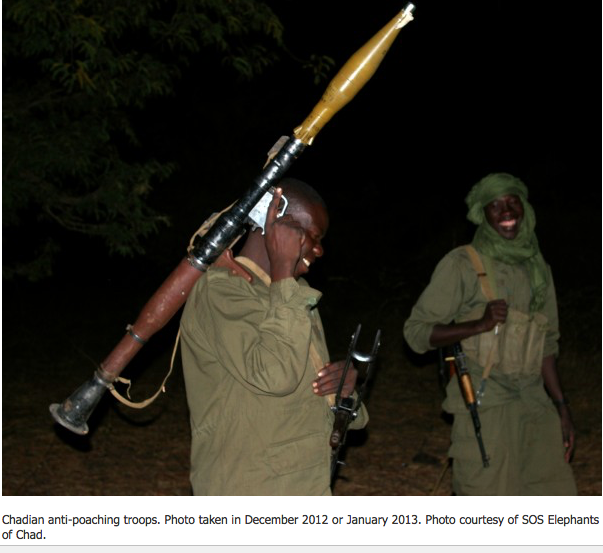 The plan calls for: mobilization of military forces in Chad and Cameroon to support anti-poaching brigades; creation of national coordination units and a mechanism for inter-state coordination; exchange of information on poachers’ movements; implementation of a tripartite agreement that would allow intervention by mixed (multi-country) brigades; and criminalization of poaching and illegal ivory trade so that penalties mirror those for organized transnational crimes. Around the world, penalties are notoriously low for wildlife crimes. On March 19 in Ireland, for instance, two rhino horn dealers were fined 500 Euros ($650) each for illegally smuggling eight rhino horns, valued at an estimated 500,000 Euros ($650,000) on the black market. Delegates at the emergency meeting also called on ivory consuming nations to adopt measures to reduce demand and restrict illegal entry of ivory. While they welcomed Thailand’s recent announcement to ban its illegal ivory trade, they pressed that country to actually implement the ban. They also urged other destination countries to redouble their efforts to combat the illicit trade. The CEEAC meeting plan echoes the themes of CITES COP16, namely: the need to work across source, transit, and range states; the need for coordinated, transnational efforts; the need to treat illegal killing of elephants and other wildlife and illicit trade in ivory and other wildlife parts as serious crimes; and the need for more effective enforcement by way of prosecutions, higher penalties, and advanced operational techniques already used to combat illicit trade in narcotics. Financing for implementation of the CEEAC emergency plan, as well as for medium- and longer-term actions, is still needed. While a 1.8 million Euro ($2.3 million) budget and timetable for actions were laid out for PEXULAB, the status of financial commitments is unclear. PEXULAB documents specified the need to set up a supra-national task force to maintain “the momentum between Governments and partners for the financing of operations.” The meeting’s final declaration invited the international community and other partners to come forward with money. To further complicate matters, lingering political instability in the Central African Republic came to a head on Sunday when rebels seized the capital and President Francois Bozizé fled the country (seeking temporary refuge in Cameroon). This chaotic situation implies that poachers can continue to roam that country with impunity. Based on sightings from the air and ground, it appears that the Sudanese poachers have broken into small bands of 10 to 15 men and are widely dispersed. However, the specific movements and exact locations of the poachers in and around Chad and Cameroon are unconfirmed, and the accuracy of reports is unclear. Some reports place a gang or gangs of poachers in or near Cameroon’s Bouba Ndjida National Park, which was the site of the slaughter of hundreds of elephants in early 2012. Lack of financing and need for high-level commitment and coordination for wildlife crime law enforcement were top issues at the CITES COP 16 meeting. But those concerns voiced by the delegates did nothing to help the pregnant elephants massacred days ago in southwestern Chad. They, and tens of thousands of other elephants, are the victims of a perfect storm of high ivory prices driven by soaring Chinese demand, low risk of ivory traffickers getting caught, low penalties for those who do, and a lack of priority at either local levels or higher political ones to get serious about elephant poaching. 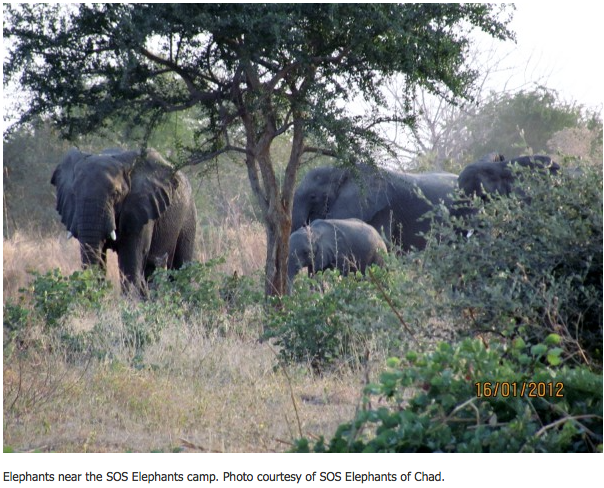 Encouragingly, Chad appears to be actively pursuing the poachers. But the situation in Cameroon and the Central African Republic is less clear, and the bottom line is that the Sudanese poachers are still hunting.